I’ve written a lot of posts in this website about the beauty of Thai art–I’ve found it utterly enchanting, and I hope you get addicted if you read enough of my posts about it. But some Thai art has a dark side. This man in the countryside around Sukhothai follows an ancient Thai tradition of wearing tattoos and amulets to protect himself from harm. Why would someone be so nervous in surroundings that I had found so charming? It’s been common in traditional Thailand to classify reality in terms of a safe inner circle which people have associated with the village, the temple and rice fields. This has often been called muang, and Sukhothai’s Wat Mahathat presides in the middle of it. It radiates benevolent energies throughout the community. But dangerous forests and mountains encircle this civilized space. Some Thais call this zone pa thu’an. It’s full of untamed energies, spirits and wild animals. Harmful influences from this outside region can suddenly emerge within the muang and create havoc. This is still a reality. 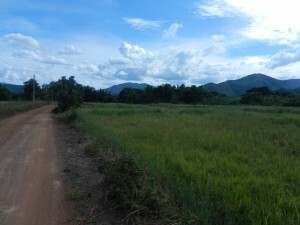 The Sukhothai area buzzed with mosquitos when I explored it. I faithfully put lotions with more than 30% DEET on all exposed skin, and I still got bitten. I met three women from Germany and England at Wat Mahathat. They had never heard of DEET, and they had so many bites that large areas of their arms and legs were solid red. 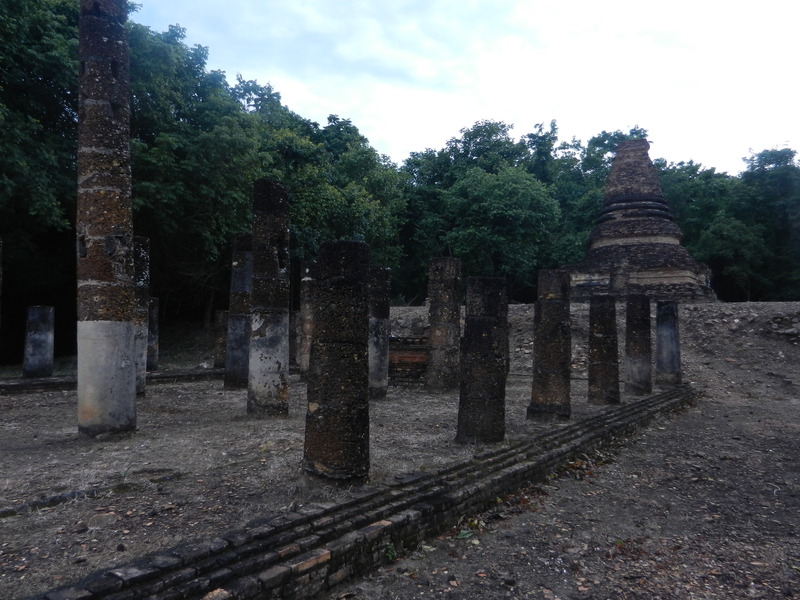 Illnesses often came suddenly in ancient Sukhothai. 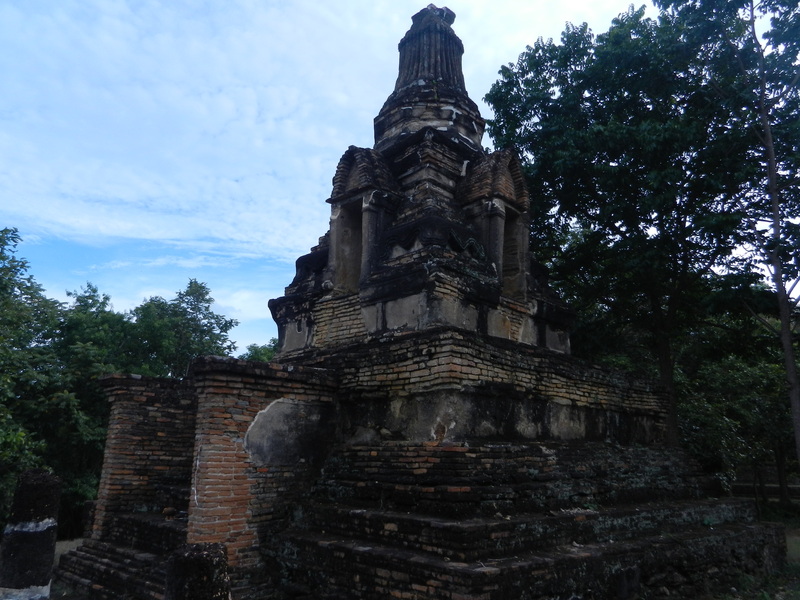 Sukhothai’s founders had this safe inside-dangerous outside concept of reality well in mind. The Ramkhamhaeng Stele states that the king’s Buddhist merit helps keep the land safe. 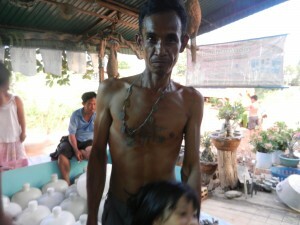 But Sukhothai’s people also honored a local mountain spirit called Phra Khaphung. He was the most powerful soul in the pa thu’an zone, and the king had to give him offerings to ensure his protection. I rhapsodized about the eastern and southern areas of Sukhothai in this blog, but the above photo looks to the west–ringed with mountains and thus full of danger. 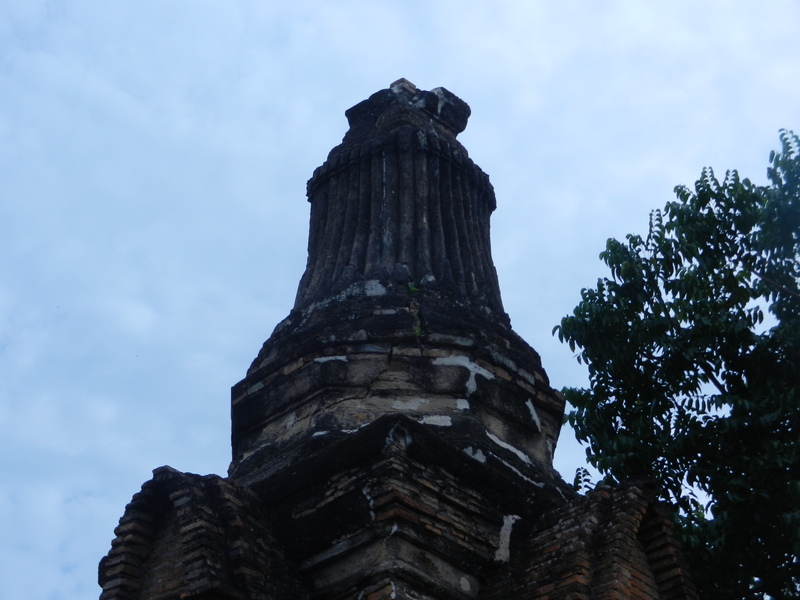 But Sukhothai’s kings tried to neutralize it by creating yet more beautiful art. Wat Saphan Hin was one of my favorite wats around Sukhothai when I went there in 2007. 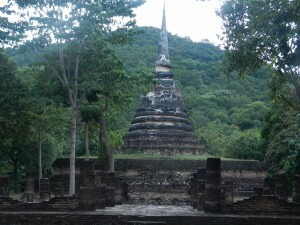 It was built on a low hilltop around Sukhothai’s western edge. My earlier post about it shows its main part. 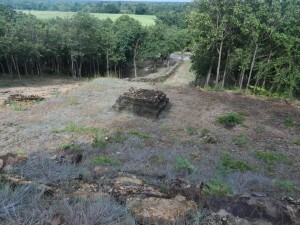 The above shot shows remains of small shrines about half way up the path. So the wat’s area was made civilized with refined art forms that embody the Buddha’s compassion. But kings actually built several wats in these hills. The above shot is of Wat Khao Phra Bat Noi (temple of the hill of the lesser Buddha footprint). 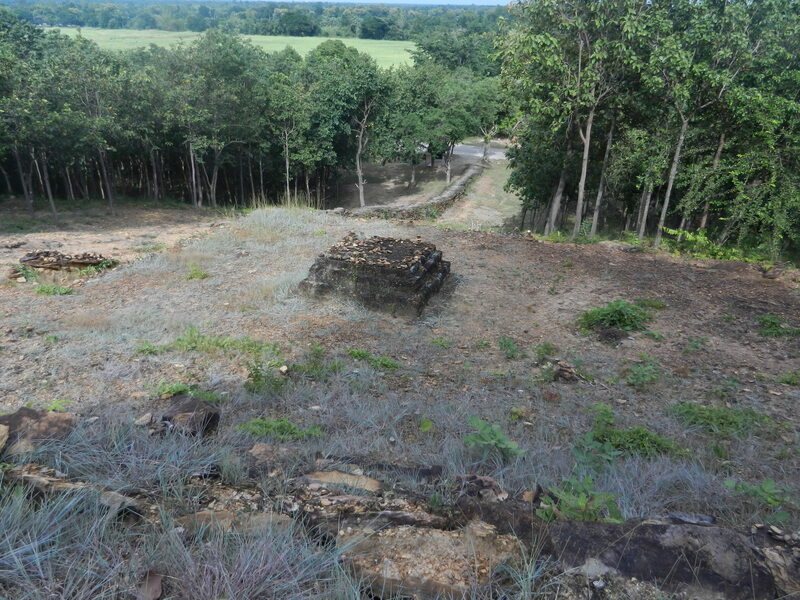 It’s also about 200 feet above the plains, and it’s a little south of Wat Saphan Hin. 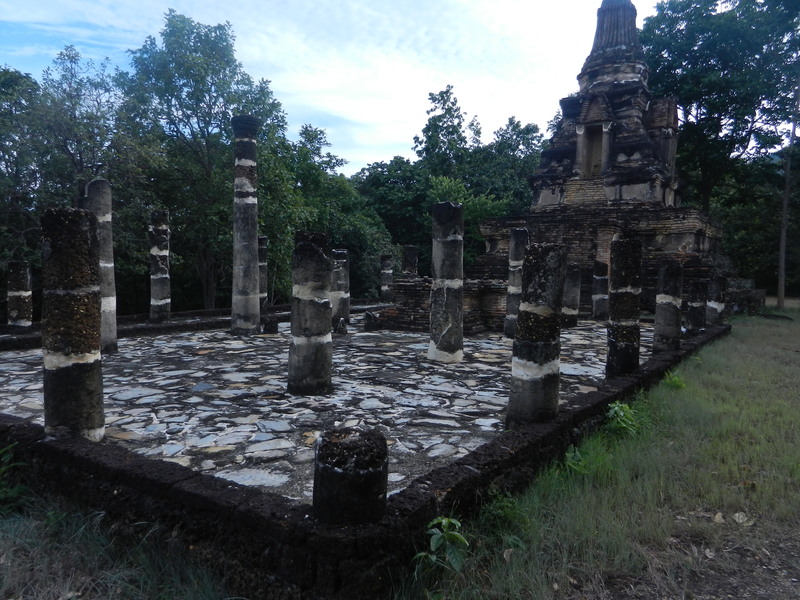 The ruins of an intimate assembly hall front an elegant stupa. The niche on each side of the stupa once housed a Buddha statue, and the assembly hall sheltered Buddha footprints. A lot of Thai wats have Buddha footprints–he supposedly visited the place and sanctified it. The top of the stupa has a pleated design that was popular in the Ayutthaya Kingdom in the south, so it might have been built after Ayutthaya made Sukhothai a protectorate in the 14th century. The base of another large stupa rests behind this one. 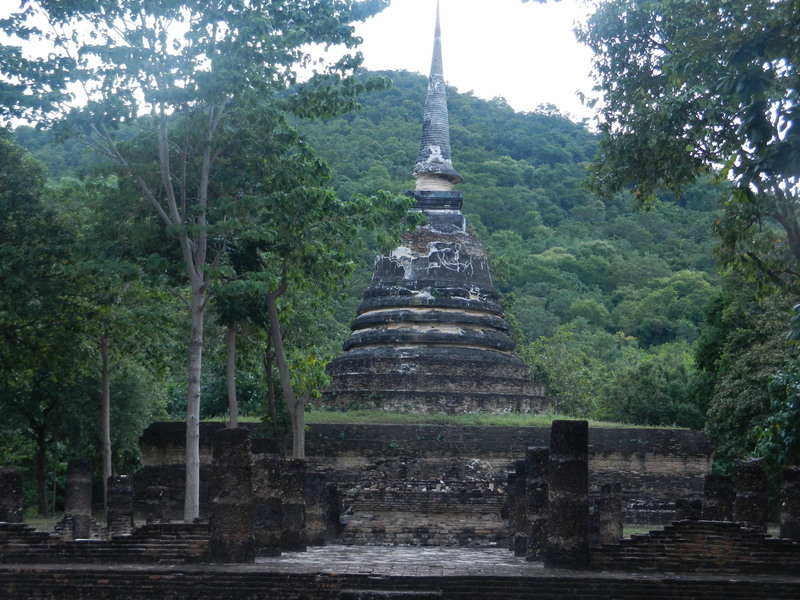 A little farther south, Wat Chedi Ngam (above) greeted me when I climbed another footpath. The graceful form of its stupa seems to soften the hill’s powers. Wat Hip Bon (above) is on the hill a little south of Wat Chedi Ngam, and it also has a small assembly hall in front of a flowing stupa. So elegant little wats bejewel a lot of the hillsides around Sukhothai, and they fill this potentially dangerous area with yet more enchanting art. 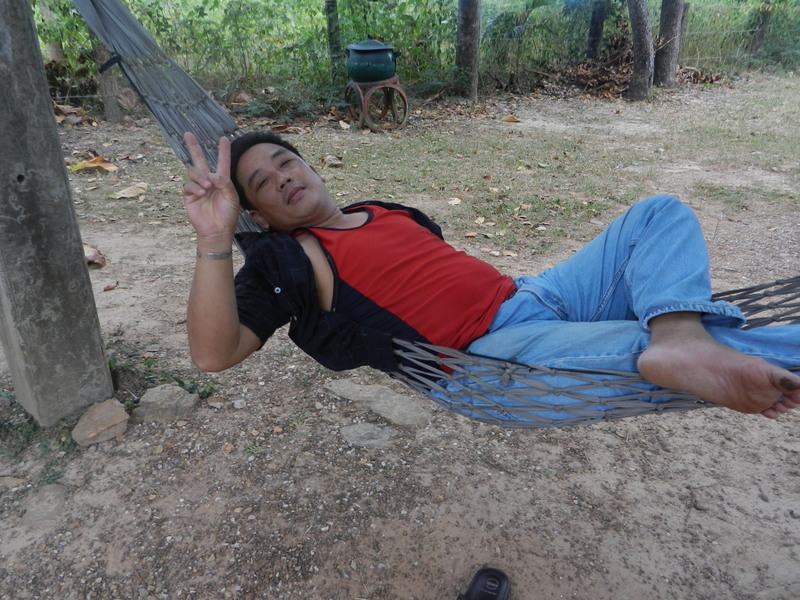 This man chilling at the bottom of Saphan Hin is much more relaxed than the guy with the tattoos. It’s hard not to lighten up when you spend a lot time around Thai temples.